Let’s be honest, the best part of riding your E-bike is going downhill. On the other hand it, can also be one of the more challenging aspects of riding. Descending with skill and control is an essential part of your E-bike experience, so here are some helpful tips and tricks to get started. 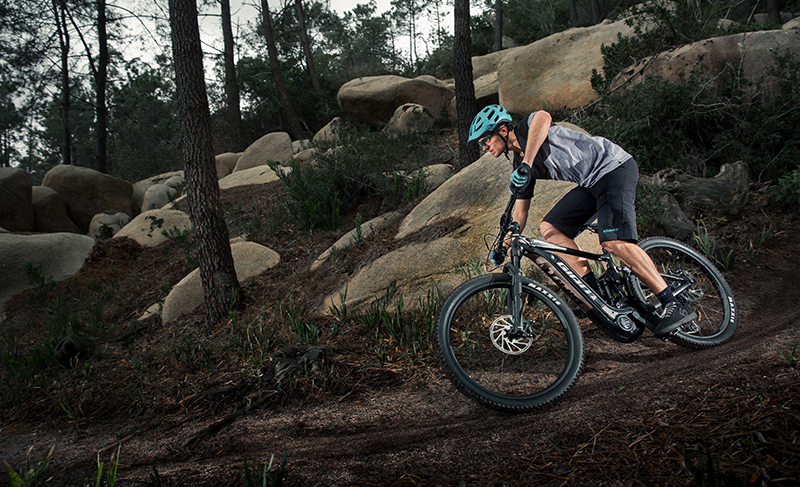 Your off-road E-bike is made for trail riding, so when it comes to descending it’s best to let the machine do the work as it absorbs the terrain. Don’t hold your handlebars too tightly. Instead, keep your arms relaxed and maintain a strong core. Also, when descending technical terrain, it helps to keep your legs relaxed and not too stiff. This allows your body to function as its own suspension system, and lets you ride with more agility. Your off-road E-bike is equipped with great suspension technology—so use it! 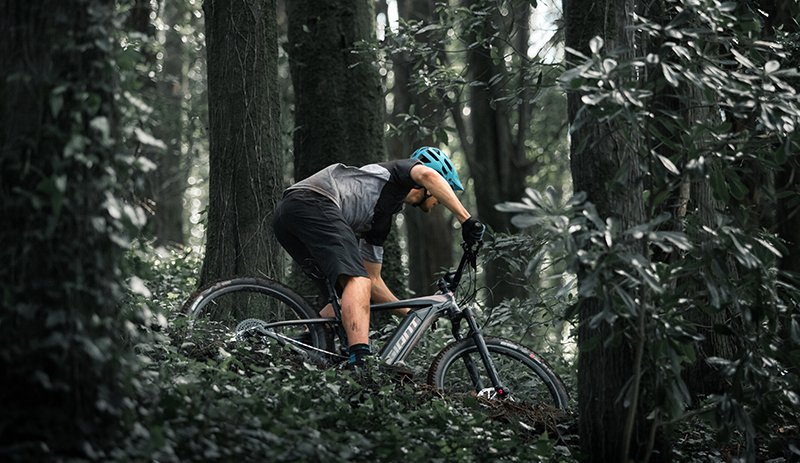 While descending, it helps to lower your weight on the bike and pump your E-bike with your arms as you roll over roots, rocks and other trail obstacles. This helps you maintain traction by keeping the tires in contact with the trail. Keeping that tire contact helps you brake, corner and ride technical terrain with more control. Look ahead to spot what comes next and focus on riding the smoothest lines. It helps to keep your eyes forward, not pointed down right in front of you, to see where the trail is going and what type of obstacles you’ll be negotiating. It sounds easy, but it takes some practice and riding time to gain the confidence to look ahead. It helps to follow another rider while you descend. This allows you to work on your riding skills without having to analyze and process your own line choices at speed. It’s best to follow someone who is skilled, but not so fast that it’s hard for you to keep up. You can learn from their line choices and also observe their technique. Dropping your seat helps you to shift your weight back. As you descend it is important to keep your weight back, and low, to stay balanced and in control. A dropper post helps—with a handlebar-mounted lever, you can drop your seat when you descend. If your E-bike isn’t equipped with a dropper post, you can also lower your saddle manually (using a multi-tool) before a long or steep descent. When the descent gets steep, it’s best to keep your weight low and behind the saddle. Bend your elbows and knees so you can move easily with your E-bike. This weight shift keeps your weight balanced and gives you more control. Keeping your heels pointed down toward the ground also helps. A crucial part of descending is braking, and using your brakes at just the right moment. It’s best to use your brakes to reduce speed before you enter a corner. This gives you more traction and control as you roll through the corner. Also, focus on using your front brake. And when you do, keep your weight shifted to the back to keep your bike planted to the ground and avoid flipping forward. The best way to improve your descending skills is to practice these tips as much as possible. As you improve your skills, you will learn to trust yourself and your E-bike while descending. Which E-MTB is for me? What if your E-bike battery runs out? Can you get a workout with an E-bike? How fast can an E-bike go?